LOS ANGELES – His career is only two movies old, but director Duncan Jones seems to specialize in science fiction that reminds you very much of other movies. ‘Moon’ (2009) certainly evoked ‘2001’ for many critics and now he delivers ‘Source Code,’ a dead-ringer for ‘Groundhog Day,’ only without the laughs. Still if you’re going to redo a classic – after 18 years that’s not too far-fetched a designation, is it? – ‘Source Code’ makes several clever adjustments, the most important being the insertion of a ticking clock into a series of events running in a continual loop. Its four main actors play sharply delineated characters, not with much depth but, hey, who has time for depth when Chicago is about to blow up? ‘Source Code,’ which premiered at the South by Southwest film festival in Texas, could develop into a minor hit for Summit Entertainment, thanks to the fine casting, a sense of claustrophobia and an intriguing race against time. The film opens April 1. Jake Gyllenhaal awakens to find himself on a commuter train approaching the Windy City. A pretty and chatty seatmate, Michelle Monaghan, takes up a conversation begun apparently several minutes earlier but the man has two problems: He has no idea who she is and, much worse, who he is. A quick trip to a toilet mirror confirms his worst fears: He is in another man’s body. The last thing the Air Force captain remembers, he was flying a plane in Afghanistan. The film gradually reveals the hero’s true situation: His mind is in the control of a government project dubbed ‘Source Code,’ which allows him to relive the last eight minutes in the life of a man who died on that commuter train, as did all passengers, when a bomb exploded. His mission is to continue to relive those eight minutes until he can identify the bomber and prevent a much greater attack threatened against the city later that day. Putting him through these minutes over and over again is a slightly cold and cerebral scientist (Jeffrey Wright), and therefore a slightly sinister one, and his loyal-to-a-point assistant (Vera Farmiga), who is much better at empathizing with the poor captain than her boss. As in ‘Groundhog Day,’ the protagonist can change events within the prescribed time frame so that in each go-around he comes away with more clues about the mystery of the bomber. Each foray into the immediate past also further insinuates the man into the lives of both his fellow passenger and his female government controller. The question hanging over all this, of course, is whether the hero can prevent the deaths of the passengers as well as capture the bomber. Wright’s scientist insists this is not possible, as ‘Source Code’ does not represent time travel but rather “time reassignment.” No prevention of disaster is possible; all the captain can do is identify the culprit so he can be captured before reaching Chicago. The Gyllenhaal character, despite exhaustion over having to be killed time after time, believes otherwise. Farmiga’s skeptical officer isn’t so certain either way and Monaghan, of course, is clueless about her impending fate. Ben Ripley’s screenplay gives Jones plenty of tension to work with, enough so that the director throws in aerial shots of the train and a few exterior scenes in train stations to relieve the audience of what amounts to a three-set movie – the train, control station and a weird capsule where Gyllenhaal’s character retreats between episodes aboard the train. In the end, filmgoers will either buy into the implausible events or not. Not helping in this matter is an ending that renders much of this nonsensical, one that strives for a “feel good” moment, but at the expense of too much logic flying out the window. 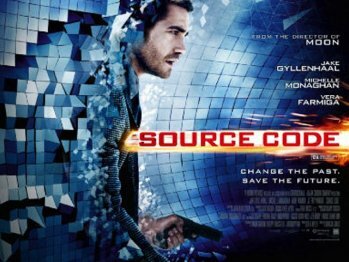 As a consequence, ‘Source Code’ reminds you somewhat of an old B sci-fi’er where ideas trump VFX and sci-fi dazzle.